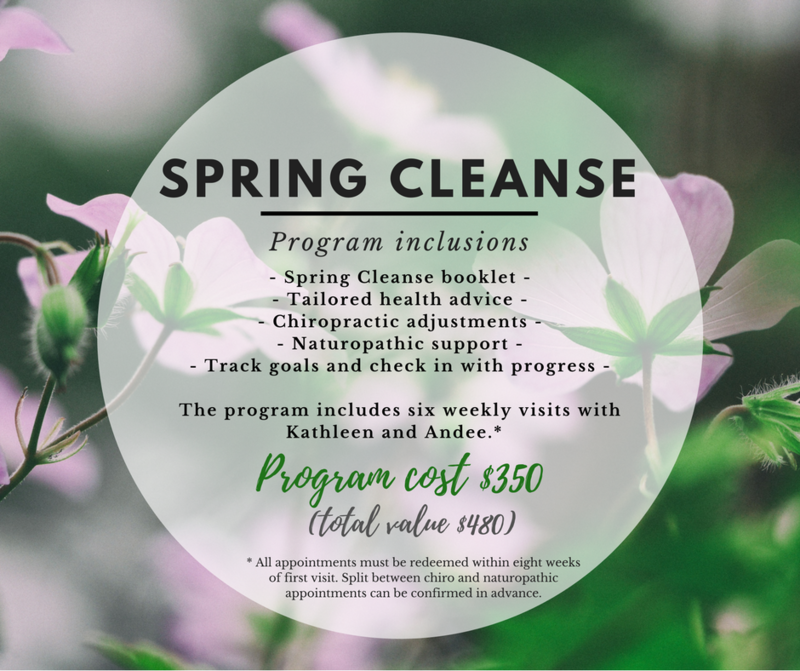 Throughout September and October, we are running a Spring Cleanse program at the clinic, to help our patients transition out of the ‘hibernation’ period of Winter and into the warm sunshine of Spring! During the colder months, many of us can relate to feelings of sluggishness… and may have health complaints related to this: extra weight, joint pain, poor circulation, etc. But. Now that Spring has arrived, the days are lengthening and the weather is beginning to warm up, it’s time to shed our winter coats! A spring clean for your health is an excellent way to welcome in the new season, and introduce some healthy eating and lifestyle patterns that can continue through into Summer. Seemingly simple changes, like increasing water intake, improving food choices and getting regular exercise can make a significant difference to your health and wellbeing! As such, we’ve designed a program to ease you back into healthy practices, to keep you on track with health goals, and create habits that can be sustained easily after the cleanse is ‘finished’. Over the next two months, Andee and I will be offering complimentary 15 minute sessions to take you through the program (which includes our Spring into Health book, free of charge) and outline your most important health goals. The aim is to get you thinking about what is and isn’t working for you at the moment, and get your started on some healthier diet and lifestyle practices. For those who would benefit from additional support, motivation and guidance (and who wouldn’t?) you can sign up for the Spring program, where we’ll follow up with you weekly to ensure you stay on track. Call the clinic on (02) 9660 7222 to find out more.